Most of the action in 100 Fathoms Below takes place onboard the USS Roanoke, SSN-709. That being said, before the crew gets underway, petty officer third class, Warren Stubic gets into some rather dark business which leads to everything which follows. You can't blame the guy, beginning the next day it'll be three months without sun, without liquor, without a woman. Life onboard this nuclear sub seemed realistic enough and essentially added depth (pun intended) to what in reality is a horror novel. "Stubic smiled back weakly, blinking in the bright, painful light. If only this were a hangover. Then he would have an explanation for at least some of what was happening to him. But not for everything. Even if he’d had too much to drink last night, which he damn well hadn’t, it wouldn’t explain the marks he found this morning on the side of his neck. Two small welts like bug bites. The tropical climate made Hawaii a welcoming environment for all sorts of insects, especially the nocturnal ones. Something had bitten him, and he wondered whether his symptoms were an infection brought on by the bite. Oh, God, was this malaria? He took a deep breath and tried not to think about it." It's not malaria, it's something far worse. I really don't want to let on much more than I have. I'll let the authors reveal their secrets as you read this fast-paced undersea horror/thriller. Everything worked for me in this collaboration. It's difficult to get an idea of who did what in the writing, but it's worth noting that the end result was a clear singular voice. Full of surprises to the very end, I can gladly recommend 100 Fathoms Below. 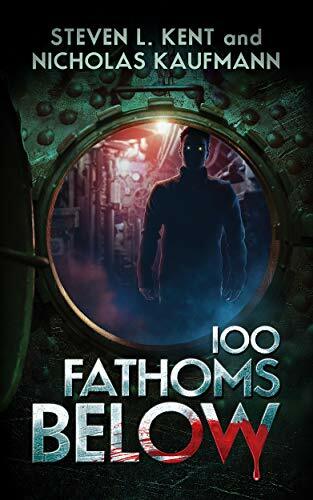 From Blackstone Publishing, 100 Fathoms Below is available in hardcover, paperback, e-book, and audio formats. Steven L. Kent has published several books dealing with video and computer games as well as a series of military science fiction novels about a Marine named Wayson Harris. While Kent earned a Bachelor's degree in journalism and a master's degree in communications from Brigham Young University, he claims that his most important education came from life. As a boy growing up in Honolulu in the 1960s, Kent developed a unique perspective. He spent hours torch fishing and skin diving. In more recent years he's concentrated on writing novels, including, The Clone Republic and Rogue Clone, both published by Ace Books. Nicholas Kaufmann is the Bram Stoker Award-nominated, ITW Thriller Award-nominated, and Shirley Jackson Award-nominated author of Walk In Shadows: Collected Stories, General Slocum's Gold, Hunt at World's End, and others. Over the years, he worked in publishing, owned his own bookstore, managed a video store, and was a development associate for a well-known literary and film agent. He lives in Brooklyn, New York with his wife and two ridiculous cats.